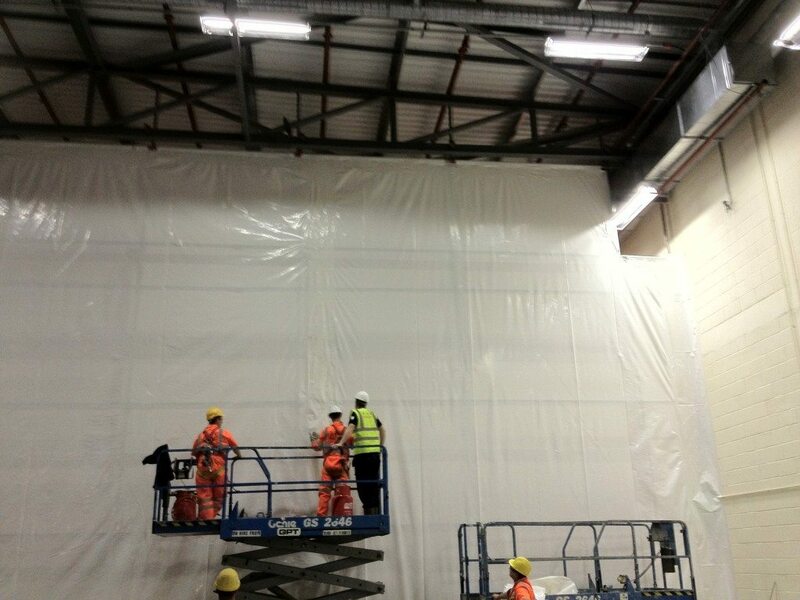 Shrink wrap sheeting can be used to create temporary internal partitions and screens, suspended ceiling covers and tunnels that protect your buildings, assets and people from dust and debris contamination during construction work. 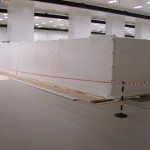 What are the benefits of a shrink wrap partition? Rhino temporary factory partitions and screens separate the work environment from the construction zone, containing dust and debris, and creating a smart & professional appearance. 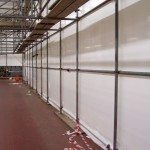 The versatility of our temporary partitions and screens enables them to be utilised in a variety of facilities such as commercial, retail and industrial. When utilised in commercial and retail environments, customers feel safe and valuable stock is protected. 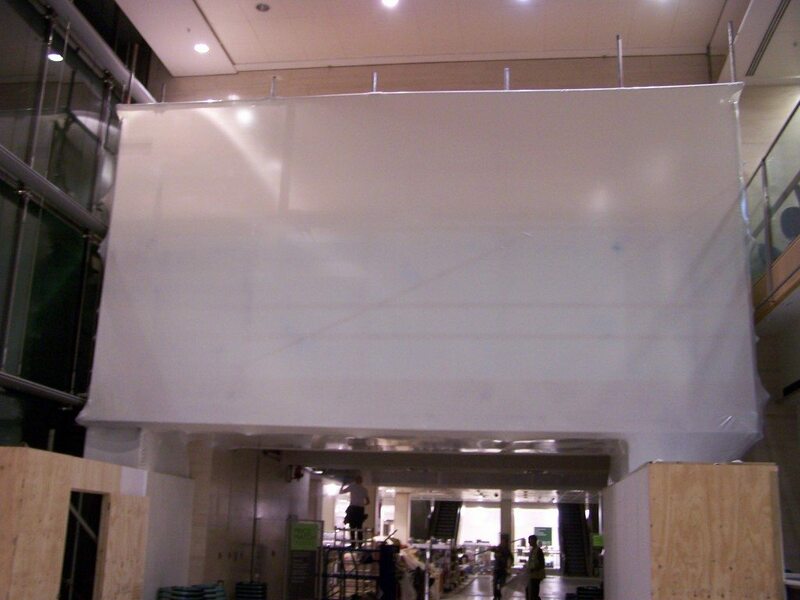 When temporary partitions are erected in industrial facilities, costly risks associated with product contamination and recalls are eliminated. By customising your temporary factory partition with access doors, Rhino’s temporary partitions not only protect against dust and debris, but also helps maintain normal work routines. This is ideal for maintaining supply chain flow and avoiding disruption and downtime. 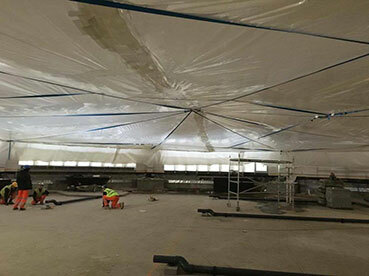 Rhino suspended covers are typically installed during re-roofing projects to protect facilities from falling dust and debris. Before this solution was introduced to the market, companies were forced to either shut down production during a re-roofing project, or risk contaminating their products. 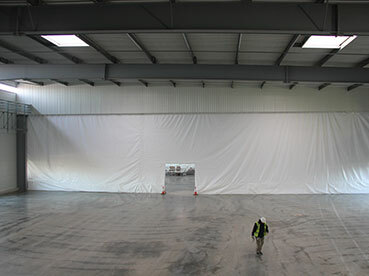 The Rhino suspended cover eliminates these risks. 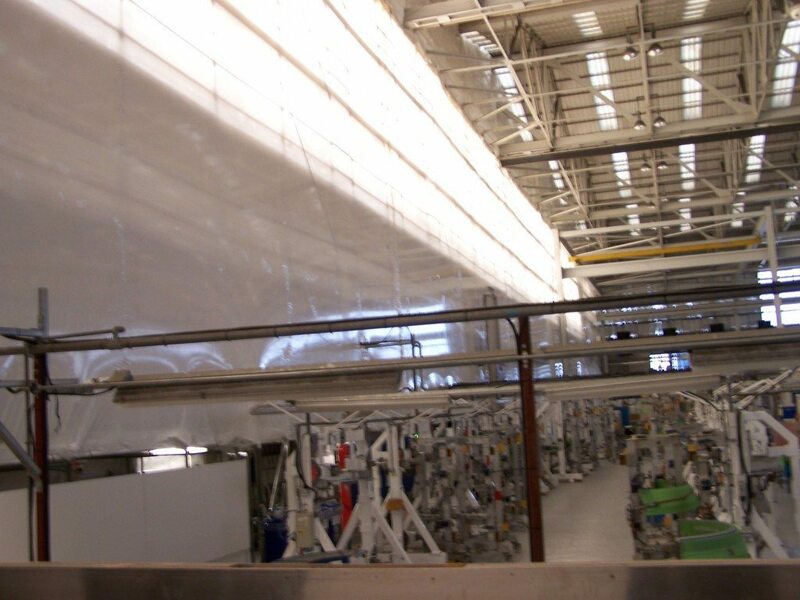 A variety of options are available with suspended ceiling covers such as netting, material options, and high structure cleaning. 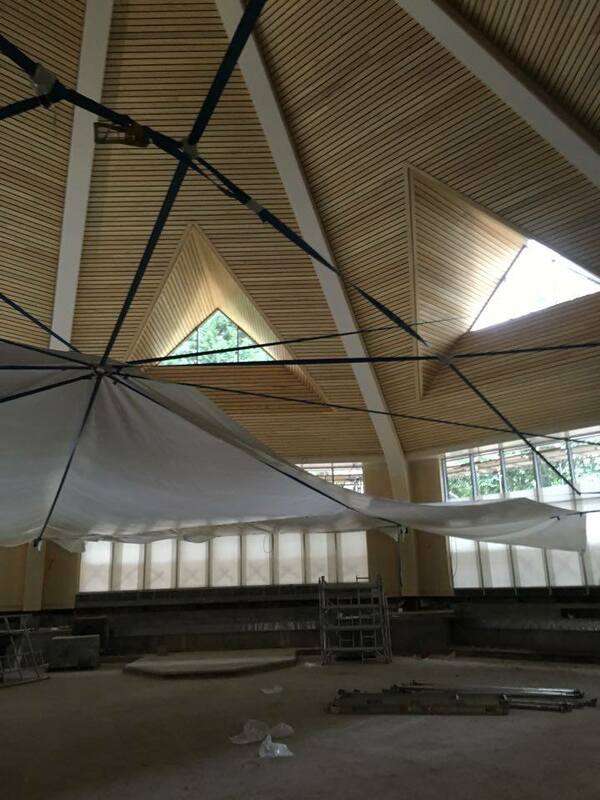 Netting protects facilities from heavier pieces of falling roof debris. Materials may be specified in clear or white. All of these options provide our clients with additional ways to protect themselves and their products from dust and debris containment. 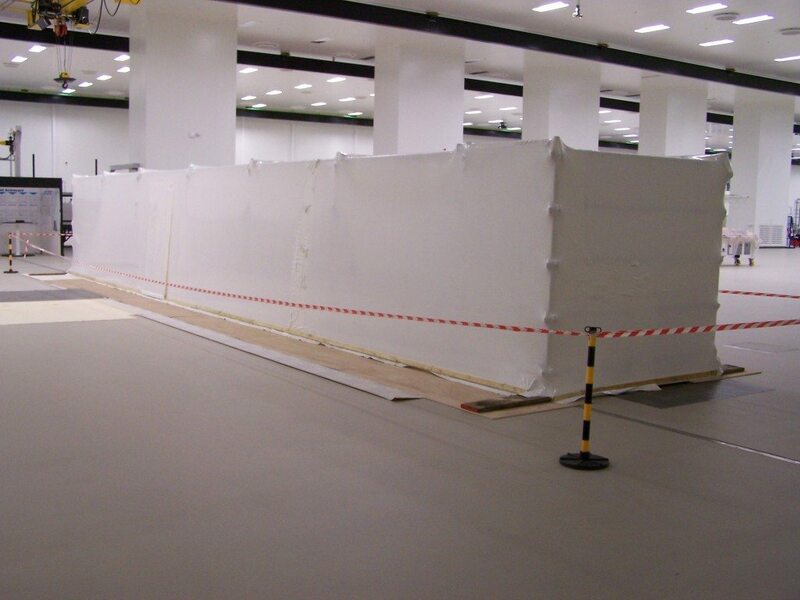 Rhino provide Total Enclosures when clients want to keep dust completely in or out of an area. This solution forms a ‘tunnel’, that provides no openings for contaminants to enter or leave. Total enclosures are often used during floor resurfacings, drilling, and other projects that require seclusion or equipment (inside or outside of the containment) to be kept clean, giving our clients confidence that contamination is not possible. Do I need scaffolding to create an internal partition? 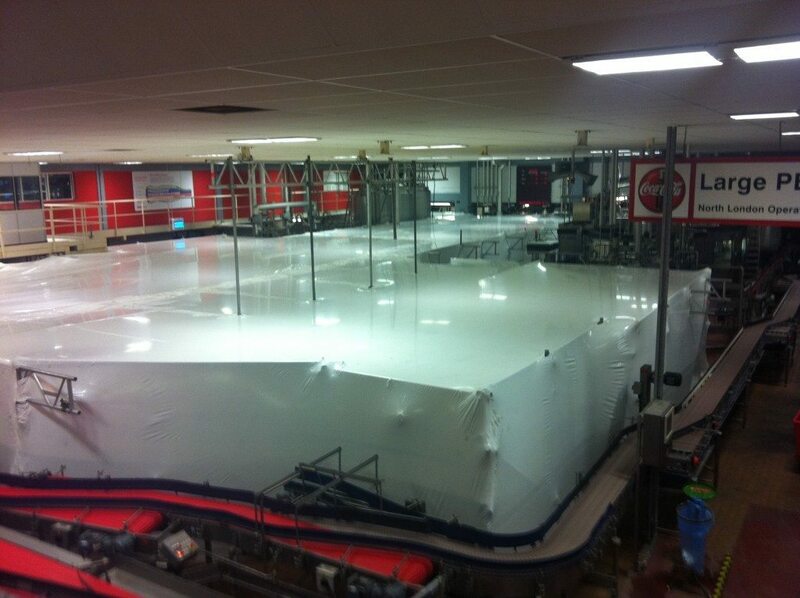 What if I need to crane something through the sheeting? 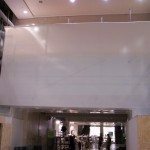 One of the great benefits of shrink wrap sheeting is that it can be cut open, perhaps to allow something to be craned inside the containment, and then re-sealed using a hot air gun and patch tape. Can you create access for people, machinery and vehicles? Zipped access doors may easily be installed. Doors range in size from 2 metres to 3.5 metres. Hatches. Installing zipped access doors in a series can create an ‘air lock’ type affect to limit heat loss or dust escaping. How do you seal the shrink wrap to the floor / wall / roof? 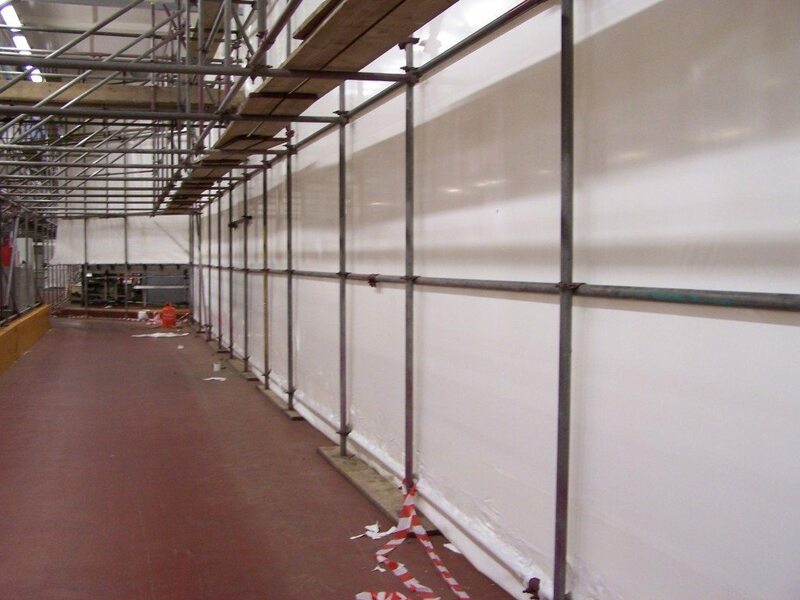 It is quite common for internal partitions to require a ‘final seal’ to a floor, wall or roof. If a scaffolding structure is present then we would ask the scaffolder to install a scaffold tube as close to the underside of the roof as possible. We would hang the shrink wrap sheet from this and then use patch tape to fix a narrow skirt of shrink wrap to seal the gap between the sheet and roof. 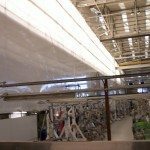 If it is possible then we use a batten to seal to factory floors.